In a small seaside park near the Kanmonkyo Bridge, in the Japanese city of Shimonoseki, stands two bronze statues depicting two Samurai warriors locked in mortal combat. The statues are flanked by replicas of cannons and ships. The monument commemorate a historic battle that took place in this area more than eight centuries ago. The year was 1185. Two powerful fleets, one consisting of the Heike clan, the imperial rulers of Japan, and the other consisting of the Minamoto, who were fighting for control of the throne, faced each other one April morning on tiny bay called Dan-no-ura in Japan’s Inland Sea. In the fierce battle that followed, hundreds of Samurai warriors lost their lives and their bodies slipped between the waves to the bottom of the sea. At the end of the day, the Minamoto came out victorious; the Heike were routed and their 6-year old emperor was drowned by his grandmother to prevent his capture. Minamoto Yoritomo went on to become the first Shogun, or military ruler, of Japan. The Battle of Dan-no-ura gave rise to many legends, the strangest of which involves a crab. This crab has a distinctive shell with a pattern that vaguely resembles the angry face of a Samurai. The story goes that when the Heike warriors died and sank, their souls were transferred to the crabs and their gnarled faces were forever etched onto the crab's back. The crab is called Heikegani or the Heike crab. Sometimes, it’s also called the Samurai crab. Famous American astronomer and author Carl Sagan once speculated that the resemblance was due to artificial selection. 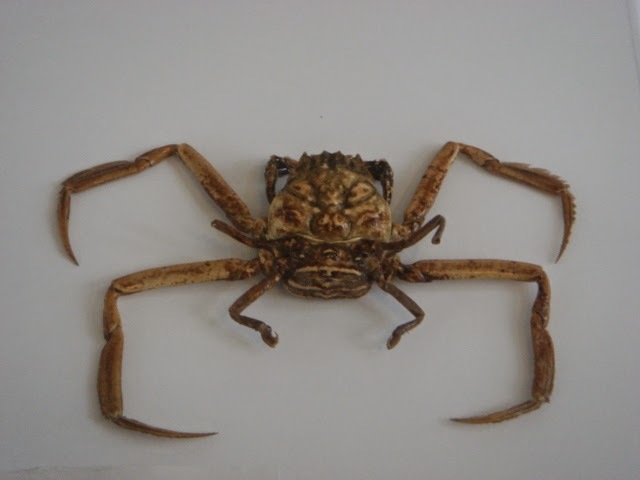 Sagan proposed that the fishermen fishing Japan’s waters would throw back any crabs whose shells looked like a samurai’s face out of respect for the fallen Heike tribe. This preserved the DNA of the heikegani with samurai-like faces while thinning the genetic lines of those without. However, the Heike crabs are tiny—about four centimeters— and nobody actually ate them, and so the fishermen used to throw them from the nets. Besides, crabs with human-like shells have been found all throughout the world. The folds and creases that resembles a snarling samurai face are actually the points where muscles attach to the carapace. They just happen to look like the face of an angry Samurai, thanks to our innate ability to find faces in random objects—a phenomena called pareidolia. The pattern of ridges on the carapace serves a very functional purpose as sites of muscle attachment. Carl Sagan theorized that the crabs’ samurai faces are the result of artificial selection. He proposed the fishermen fishing Japan’s waters would throw back any crabs whose shells looked like a samurai’s face out of respect for the fallen heike. This preserved the DNA of the heikegani with samurai-like faces while thinning the genetic lines of those without.